I absolutely love when my close friends and family are expecting. This new found happiness is definitely a result of me learning to sew. As soon as I hear the news I begin looking for cute and unique nursery fabric. Needless to say, when a friend told me that she was expecting, I quickly jumped into the "what can I sew?" frame of mind. My go to DIY|baby shower gifts are burp clothes (because you seriously cannot have too many of those), clutch diaper changing pad, and baby bibs (again you seriously cannot have too many of those). But I really wanted to do something special for her and I also wanted to test my sewing skills on an actual bag pattern. I stalked Swoon Patterns' Instagram page for days and decided to give the BELLE DIAPER BAG pattern a go. I purchased the paper pattern because I really didn't want to spend time printing and taping the pattern together. I got the pattern months in advance with intentions on having it finished at least a month before the baby shower, but yea, that didn't happen. I didn't start on the pattern until three weeks before the baby shower, and due to my work schedule and life in general, it took me two weeks to complete it. All in all, the bag turned out great and the mother to be loved it! The diaper bag will not be a part of my go to DIY|Baby Shower gifts but I definitely will be using it again. 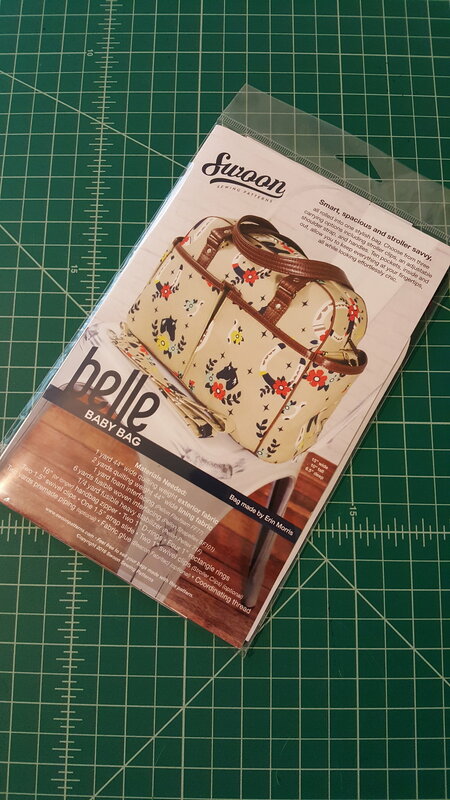 The Belle Diaper Bag pattern review is below. The foam interfacing was a beast! Take your time when sewing through it, no way you want to rip those seams. Belle Diaper bag has three carrying options, including stroller clips, an adjustable shoulder strap, and handles. The bag has ten pockets, six on the outside and four on the inside. Did it look like the photo/drawing on the pattern envelope once you were done with it? Yes, it looks like the photo. Yes, very easy to follow. Quilting cotton, foam interfacing, woven interfacing, fusible heavy stabilizer, zipper, swivel clips, strap slide, rectangle rings, d-rings. I would have liked a cutting layout diagram for the pieces. This pattern requires a lot of material and any suggestions on how to place the pattern on the fabric to get the most out of my material is always appreciated. I am not sure if this is typically done for bags and wallets but I did a wallet course through Craftsy and the instructions included a diagram for pattern placement. I found myself wishing for something similar with the diaper bag instructions. I used 1” swivel clips instead of the suggested 1.5" swivel clips. I also used a 1” strap slide instead of the suggested 1.5” swivel slide. The instructions direct you to measure and cut the fabric for the handle connectors at 2 x 21 but I cut it at 4 x 21. I made the same adjustments for the adjustable strap and strap connectors, instead of cutting it at 6” x 60” and 2 “x 6”, I cut it at 4” x 60” and 4” x 6”.